This is a review of Swanson Health Products Biotin. This company claims Biotin helps energize the body and strengthens skin, nails, and hair. 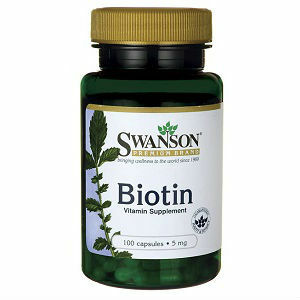 Our bodies need Biotin to break down fats and carbohydrates. Read on to learn more about Biotin’s ingredients, price, guarantees, and how it works as a healthy hair supplement and decide if it can work for you. A lack of Biotin in the body is usually noticed by thinning and color loss in the hair. This one ingredient claims to supply cells with energy, making hair, among other things such as skin and nails, stronger. One pill is to be taken daily, with water. There are no known side effects by taking Biotin. It is considered safe to use by the FDA even in pregnant or breast feeding women. making this an excellent choice for them if experiencing hair loss. It should be noted that taking supplements without eating can lead to upset stomach. If you have never taken Biotin and you experience allergic reactions which are rash, dizziness, or vomiting, discontinue use and see your physician. At only $3.79 a bottle, you will receive a one hundred day supply of Biotin. There are shipping charges at the standard rate of $4.99 you’ll need to add to the amount. You can also sign up for the Easy Refill plan which will save you ten percent off of the price. You can choose to receive the new bottles every thirty, forty-five, sixty, seventy-five, or ninety days, it’s up to you which makes it convenient. This product comes with a one hundred percent satisfaction or your money back guarantee. Of course, this does not include any shipping charges. So trying out this product is risk free. The makers claim this product helps to promote healthy hair. This product claims to boost the overall health and appearance of the hair, nails, and skin without any known side effects. The price of this product is much less than other hair regrowth products, and if you sign up for the discount program the price goes down even further. The manufacturer offers a one hundred percent satisfaction or your money back guarantee. This product is considered risk free. This product is considered safe to use long term with no adverse effects. After researching consumer reviews of this product it was found to have mostly positive reviews with people claiming results after three months of use. Negative reviews consisted of mostly slow results to no results. This is not a vegetarian-friendly product as it uses a gelatin covering for the pill. Most similar products contain many more ingredients to help hair growth. John Brownstone	reviewed Swanson Health Products Biotin	on August 3rd	 and gave it a rating of 3.5.